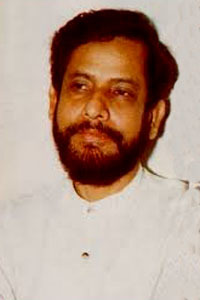 Asaduzzaman Noor is an actor, entertainer and a politician and activist from Bangladesh. He is mostly noted during his early days as a Bangladesh Television drama artist. In the 1990s he acted in a drama titled Kothao Keu Nei - There is no one anywhere. This drama, written by Humayun Ahmed (a popular writer in Bangladesh), became a sensation and the character Baker bhai who is hanged for his brutal honesty, lives on as a legend. Noor came to politics during the period of autocrat Ayub Khan in 1962 Noor then a student (who just gave matriculation), joined the East Pakistan Student’s Union which was a left sided organization. Later he became the chairman of the Nilfamari Mohokuma Shomeetee. In 1966 he got admitted to Dhaka University to study law still a member of the Student’s Union. Later he became the cultural secretary of the central committee. He also was the chairman of the "Shongskriti Shongshod", a very large cultural organization of Dhaka University. Noor stayed in the Iqbal Hall (now Johurul Huq hall) which was the centre of student politics during that period. At that time Noor came in contact with the versatile student leaders of that time. Though the followers of different political belief they worked together against the dictatorship of West Pakistan government. At the eve of Bangladesh Liberation War, Noor left Dhaka and came back to Nilfamary when he received an order from his political party on March 8, 1971. There he helped the then East Pakistan Rifles (former Bangladesh Rifles, now Border Guards Bangladesh). He crossed the border during the War of Liberation on April 8. Asaduzzaman Noor was a freedom fighter under the Sector-6 and helped to organize the war and took training. He also helped to recruit freedom fighters during the nine month war period. But later in the independent Bangladesh his distance with active politics grew larger. In 1990 when the Revolution against autocrat Ershad took place, Noor again came to join the movement. With this event Noor made a come back to politics again. In that time Noor came in touch with Sheikh Hasina, the leader of one of the main political team Awami League. In 1996 Hasina asked him to take part in the election for Awami League. Because of not being mentally prepared Noor turned that down and worked as a cultural activist for the Party. During the flood of 1998 Noor went to Nilphamari to supply relief where he met with local political leaders. With interest and support from his near ones, Noor decided to take part in the election in 2001 and won that to become a member of parliament (MP) from the Nilphamari District. His career in the theatre started in 1973 when he joined the largest group “Nagorik”. Noor was a receptionist of the paper “Chitraly” at that time and went to take the interview of the famous actors that time. There he met Ali Zaker, a famous actor of Nagorik who asked him to visit the rehearsal of his new team. Noor later went there and saw a lot of his familiar faces of the University. Later he joined that group. At first he used to work behind the stage as a prompter. Once the rehearsal of the drama “Toilo Shonkot” which was written by Rashid Haider was going on. With only two days remaining of the first show actor of that drama Abul Hayat got injured, Ali Zaker asked Noor to take the part. With a bit force from the others Noor took it and started his career as an actor. Asaduzzaman Noor’s first TV drama "Ronger Fanush" which was directed by Abdullah Al Mamun. •	Ei Sob din Ratri: Written by Humayun Ahmed. A story about a middle class family. Their sadness, happiness, struggles, and dreams of everyday life. •	Oyomoy: Originally a novel written by Humayun Ahmed, this epic series follows the life of a landowner (Character name: Chhoto Mirza) in rural Bangladesh during an era of ignorance. Asaduzzaman Noor portrayed the wild characteristics of a protagonist subdued by wealth and a moral dilemma, brought about by the sheer mistrust of his own conscience. •	Bohubrihi: Also written by Humayun Ahmed, Noor plays a poet, who has had the misfortune of losing his wife, but lives merrily through his creative art and his two rather mischievous children. Although not a protagonist, he will be forever remembered as 'Anis bhai'. •	Kothao Keu Nei: Another Humayun Ahmed production, considered a milestone in Noor's career and also in Bangladeshi TV drama. Noor played the role of 'Baker Bhai', a goon who is popular in the locality for his idealistic views. The serial ended with the trial and execution of Baker bhai in a murder case plotted by his adversary. This created a huge emotional impact nationwide. •	Ke Hotey Chay Kotipoti:Noor hosts the show.Its a Bengali game show which is a Bangla version of the British famous show "who wants to be millionaire? The show airs on Desh TV every Monday to Tuesday at 9.45 pm.Moinul Hossain Mukul has produced it. • Aguner Poroshmoni: In Humayun Ahmed's portrayal of the Bangladesh Liberation War, Noor plays the central character of a freedom fighter, who finds love among chaos in Dhaka. He received national acclaim along with the other casts of the film for performance. • Shahid Munier Chowdhury Award, 2006.